Background: Obesity is a major health problem worldwide. An increase in body weight is considered to cause overload of the foot, which represents the interface between the body and ground. This can induce various stress and strains during walking that can predispose to overuse injuries of the lower limb. Purpose: To compare and correlate the effect of weight on calcaneal eversion, gastrocnemius extensibility and angle of toe-out. Method: Forty females with a mean age of 24.3 years were divided into 2 groups according to their body mass index (BMI). Group A (n = 20, BMI = 19 – 24) and Group B (n=20, BMI = 25 – 29). Measurements for calcaneal eversion were obtained in double limb and single limb stance, whilst gastrocnemius extensibility was obtained in a prone position. The angle of toe-out was obtained during walking. Result: There was a significant difference (p<0.05) between the two groups for double limb stance, gastrocnemius extensibility and angle of toe-out. No significant difference (p>0.05) was noted for single limb stance. Conclusion: The angle of calcaneal eversion and angle of toe-out are greater in overweight individuals, whilst gastrocnemius extensibility is greater in normal subjects. Key words: Calcaneal eversion, gastrocnemius extensibility, angle of toe-out, weight, body mass index (BMI). To compare the effect of weight on calcaneal eversion, gastrocnemius extensibility and angle of toe-out. A further aim was to establish the correlation between calcaneal eversion, gastrocnemius extensibility and angle of toe-out. There will be an effect of weight on calcaneal eversion, gastrocnemius extensibility and angle of toe-out. Subjects: Female students of SBSPGI, Balawala, Dehradun took part in the study. All data were collected at the Research Laboratory, Department of Physiotherapy, SBSPGI, Dehradun. Forty female subjects with a mean age of 21.1 ± 1.0 years were divided into 2 groups based on their Body Mass Index (BMI). Twenty females with a mean age of 21.8 ± 1.8 years with BMI = 19 – 24 were assigned to Group A (normal). A further twenty females with a mean age of 20.5 ± 1.6 with BMI = 25 – 29 were assigned to Group B (overweight). 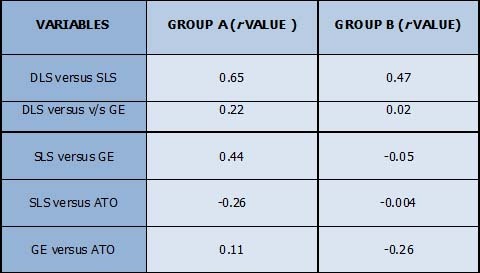 Table 1 shows the subjects information. None of the subjects had a history of congenital deformity, ligament injury, other soft tissue injury, fracture, pain, limb length discrepancy at least 6 months prior to the start of the study. Informed consent was obtained from all the subjects prior to participation. Table 1 Description of of subjects. S = Significant (p<0.05 ); NS = Not Significant (p>0.05); SD = standard deviation. 1. Measurement of calcaneal eversion in double and single limb stance. *Measurements were taken for double limb stance (DLS), single limb stance (SLS), angle of turn out (ATO) and gastrocnemius extensibility (GE). Two measurements were taken and the average was calculated. Subtalar joint eversion was determined with subjects positioned prone with lower half of calf off the edge of plinth. Sliding calipers were used to identify mid points on the calf and calcaneus and lines were drawn along the midlines on the posterior third of calf and calcaneus. Range of eversion was measured using a goniometer. The axis of standard goniometer was placed between the malleoli in the frontal plane. The stationery arm of goniometer was placed over the line on the posterior region of the calf and the movable arm was placed over the line on posterior calf. A 3-meter walkway was created using crepe paper. A chair was placed at the end of walkway to provide orientation during the ambulation trail. Water-soluble ink was applied to the plantar surface of the right foot. The significance level selected was 0.05. An independent t–test was performed for comparing calcaneal eversion, gastrocnemius extensibility and angle of toe-out between Group A (normal ) and Group B (overweight). Pearson’s correlation coefficient to establish the association between the variables within Group A and B. 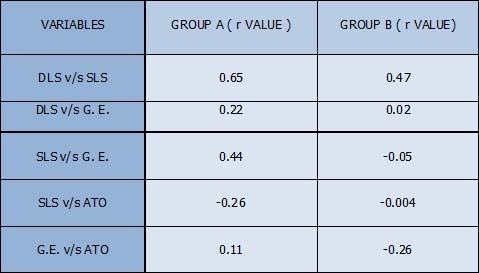 For Group A (Normal): The DLS and SLS showed a positive correlation (r = 0.65). DLS and GE have a weak positive correlation (r = 0.22). SLS and GE share a positive correlation (r = 0.44). 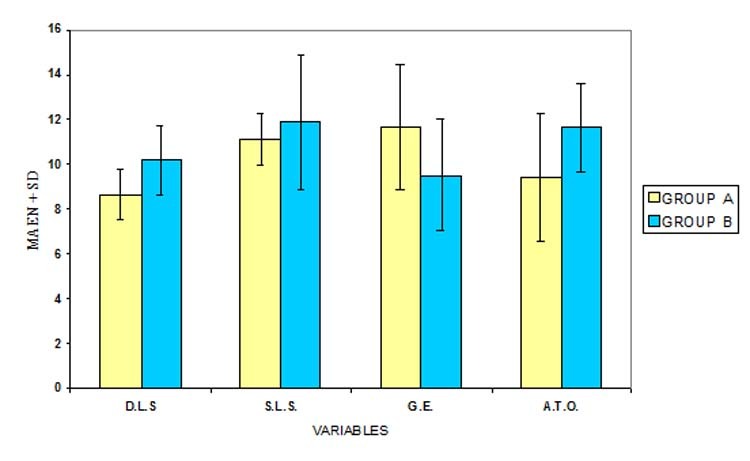 SLS and ATO have a weak positive correlation (r = 0.11) Table 3 shows the correlation between the variables in Group A and B.
Whilst not particular strong, a number of positive and negative correlations were found between the variables for each of the 2 groups. In particular, the study revealed that calcaneal eversion and ATO are associated whereas GE is less in overweight when compared with normal subjects. The findings of this study show that a higher BMI can influence foot characteristics which may therefore predispose individuals to musculoskeletal pain. We are thankful to all the staff members of SBSPGI, Balawala, Dehradun. 1. Riddiford-Harland DL, Steele JR, Storlien LH: Does obesity influence foot structure in prepubescent children? International J Obesity 24 (5): 541 – 544, 2000. 2. Valmassy RL: Clinical Biomechanics of Lower Extremities. St. Louis, MO: Mosby, 1996. 3. Hennig EM: The Human Foot During Locomotion- Applied Research for Footwear, 2002. http://www.cuhk.edu.hk/iso/weilun/en/hennig/hennig_fulltext1.html Accessed 27th July 2009. 4. Vicenzino B, Fielding J, Howard, R, Moore R, Smith S: An Investigation of the antipronation effect of two taping methods after application and exercise. Gait Posture 5: 1 – 5, 1997. 5. Doxey GE: Calcaneal pain – A review of various disorders. J Bone Joint Surg 72A 884 – 888, 1987. 6. Karas A, Hoy J: Compensatory midfoot dorsiflexion in individuals with heelcord tightness. J Prosthetics Orthotics 14 (2) 82 – 93, 2002. 7. Stovitz SD, Coetzee JC. Hyperpronation and foot pain: step toward painfree feet. 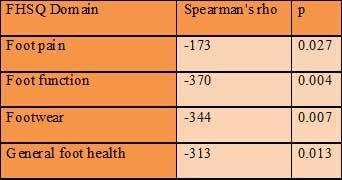 Physician Sports Medicine 32 (8): 1 – 10, 2004. 8. Magee DJ: Orthopaedic Physical Assessment. 4th edition, WB Saunders, Philadelphia, 2002. 9. Garrett WG, Kirkendall DT: Exercise and Sports Science. Lippincott Williams and Wilkins, Philadelphia, 2000. 10. Pryor J, Prasad A, Ammani S: Physiotherapy for Respiratory and Cardiac Problems. 3rd edition, Churchill Livingstone, Edinburgh, 2001. 11. Johanson MA, Donatelli R, Wooden MJ, Andrew P, Cumminge GS: Effects of three different posting methods on controlling abnormal subtalar pronation. Physical Therapy 79 (2): 149 – 158, 1994. 12. Wang SS, Whitney SL, Burdett RG, Janosky JE: Lower extremity muscular flexibility in long distance runners. 17 (2): 102 – 107, 1993. 13. Wessling KC, Devane DA, Hylton CR: Effects of static stretch versus static stretch and US combined on triceps surae muscle extensibility in healthy women. Physical Therapy 6 (5): 674 – 679, 1987. 14. Rossner Buchanan K, Davis IM. 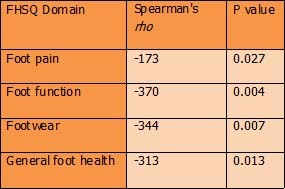 The relationship between forefoot, midfoot and rearfoot static alignment in pain-free individuals. J Orthopaedic Sports Physical Therapy 35 (9) 559 – 566, 2005. 15. van Schie CHM, Boulton AJM: The effect of arch height and body mass on plantar pressure wounds 12(4): 88 – 95, 2000. 16. Hall CM, Thein Broody L: Therapeutic Exercises – Moving Towards Function. Lippincott and Wilkins, Philadelphia, 1999. 17. Harris RI, Beath T: Hypermobile flatfoot with short Tendo Achilles. J Bone Joint Surg 30A 116 – 150, 1948. 18. Charrette M: Orthotic Support for Overweight and Obese patients- The Chiropractic Journal, 2002. http://www.worldchiropracticalliance.org/tcj/2002/jul/jul2002charrette.htm Accessed 27th July, 2009. 19. Kendall FP, McCreary EK, Provance PG: Muscles: Testing and Function. 4th edition. Williams and Wilkins; Baltimore, 1993. 20. Brown LP, Yavorsky P: Locomotor biomechanics and pathomechanics: A review. J Orthopaedic Sports Physical Therapy 9 (1) 3 – 10, 1987. 21. Kernozek TW, Ricard MD: Foot placement angle and arch type: Effect on rearfoot angle. Arch Phys Med Rehabilitation 71 (12) 988 – 991, 1990. 22. Chang WN, Tsirikos AI, Miller F, Schuyler J, Glutting J: Impact of changing FPA on foot pressure measurement in children with neuromuscular diseases. Gait Posture 20 (1): 14 – 19, 2004. 23. Messier SP, Davies AB, Moore DT, Davis SE, Pack RJ, Kazmar SC: Severe obesity: Effects on foot mechanics during walking. Foot Ankle Int 15(1);29-34, 1994. 1 Qualification- MPTh (Neurology), Institution and Address- Department of Physiotherapy, SBSPGI, Balawala, Dehradun , Uttarakhand-248161, India. 2 Senior Lecturer, Qualification- MPTh (Sports Medicine), Institution and Address- Department of Physiotherapy, SBSPGI, Balawala, Dehradun , Uttarakhand-248161, India. 3 Lecturer, Qualification- MPT (Sports), Institution and Address- Department of Physiotherapy, SBSPGI, Balawala, Dehradun , Uttarakhand-248161, India.